The Ex Serie Starter Kit comes with 2 batteries, 5 EX Cartridges and our latest USB Express Charger that is not only fast, but is also clever enough not to overcharge your batteries. The EX Series Standard Kit is a perfect introduction to our premium EX line of batteries and cartridges. This kit saves you money over shopping a la carte and includes everything you need to upgrade to EX. Your EX Series Standard Kit comes with two EX Batteries in the designs of your choice, one 5-pack of EX Cartridges and the V2 Charger Kit. Your V2 Charger Kit is compatible with both regular V2 and V2 EX Batteries. You can select 1 pack of EX cartridges in any flavour above. Strengths for EX Cartridges include 1.8%, 1.2%, 0.6% and 0%. Our customers rave about V2 flavours and we have one that is sure to become your favourite. Our popular flavours include: V2 Red (American Tobacco), Sahara (Turkish Tobacco), Congress (Refined Tobacco), V2 Menthol (Refreshing Mint). 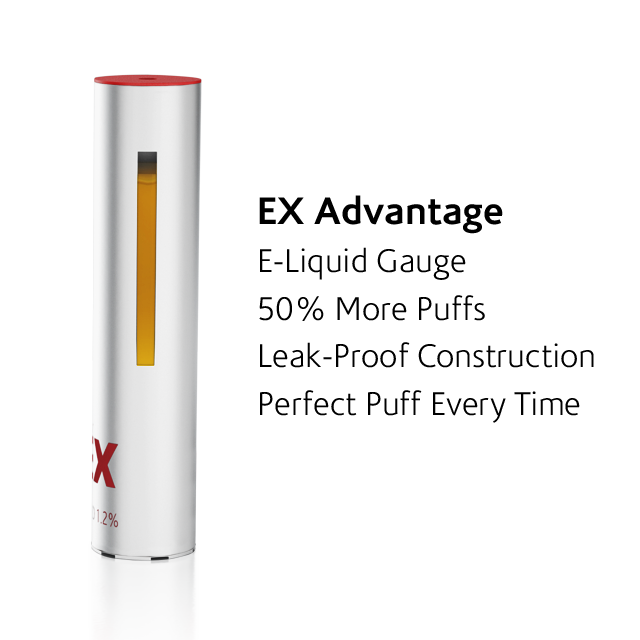 V2 EX electronic cigarettes are have just two components (so they are very easy to use) the EX Flavour Cartridge and the EX Battery. V2 EX Flavour Cartridges are filled with top quality V2 e-liquid; PG/VG, water, flavourings and nicotine (unless you prefer zero nicotine), in your selected flavour and strength. Our cartridges contain built in atomizers, so there is no cleaning or maintenance required apart from the occasional wipe of your battery connector. V2 are the only e-cigarette company who tests and publishes the results of each batch online to ensure you receive the best quality product. V2 EX Starter Kits are shipped with our premium automatic EX Series Batteries (100 mm). 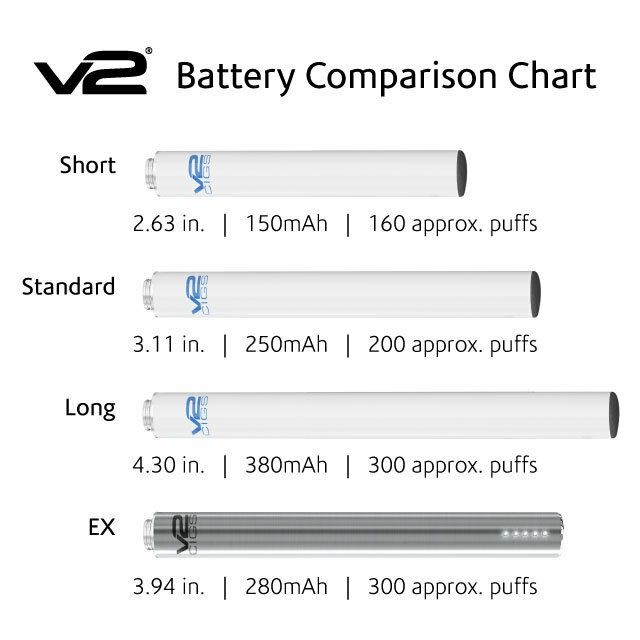 V2 EX Batteries are designed to offer a perfect balance between physical weight and vaping time per charge cycle. To use your V2 EX electronic cigarette, simply screw your EX flavour cartridge on to the end of the battery and puff on it like you would a normal cigarette. When you draw air through the cartridge, the heating element will automatically activate and produce great tasting vapour. Every V2 EX Flavour Cartridge is filled with enough V2 e-liquid to produce up to 400 puffs (depending on the deepness of each puff). A custom window on the side of your EX Cartridge allows you to see the level of e-liquid left inside. When the EX Cartridge is empty, simply discard it and screw on a fresh one — it's that simple! Your EX Battery is equipped with charge indicator lights that let you know when it’s time to recharge. V2 EX Batteries can last anywhere from a few days to more than a week between charges (dependent up your vaping frequency and puffing style). The battery can be fully charged in just a few hours with included Smart Charger. It’s important to find the right combination of flavours and strengths when you first begin using electronic cigarettes. We suggest starting with a medium strength [1.2%] or a mix of strengths, depending on your cigarette usage. Some mild tobacco smokers find the highest strength cartridges to be too strong as they deliver a big hit and throat catch. The best way to find the right flavour for you is with a V2 Sampler Pack which has 6 different flavours per pack. After 40 years of smoking a pipe, I decided to give vaping a try after health organisations such as the UK's NHS had finally acknowledged that vaping is significantly (95%) less bad for you than smoking tobacco. The trouble was, I knew nothing about the practicalities. After googling, it soon became evident that Vapour 2/V2 is a credible and highly recommended company, and their website led me nicely onto the EX Standard Kit as the ideal way to start. I wasn't disappointed, having chosen an automatic and a manual battery to test out and a pack 1.8% Red cartridges. I took to it instantly and haven't touched a pipe for over 2 weeks, and sincerely doubt I ever will again. Since then, I've enjoyed sampling different flavours, and using E-Liquid with EX Blanks and Classic blank cartridges. A great product and strongly recommended, plus their customer service is excellent (the manual battery stopped working and was replaced swiftly without any quibbling). Pleasantly surprised by this kit, works very well is just what i was looking for. taste and clouds good. Not sure how the cost will add up. Works well loads of clouds, would recommend. This is my first time using an e cig so can't compare it to any other brands. But I must say I find the V2 EX brilliant, started on the pre filled carts but found they didn't last very long. Now on the blanks and found they are much better and cheaper. I smoked golden virginia hand rolling tobacco and found that mixing half congress and half red (1.8) hit the spot. I'm 50 years old and smoked for about 30 years, since I've been on the V2 EX I've had 6 roll ups in a week, and that's only because I had the tobacco in the house otherwise I wouldn't have bothered. Would highly recommend in trying it to anyone. I quit real cigs menthol 30 a day using a different brand of e cig but they were hugely fat to hold. These are slim and look good. The vapour taste of menthol is not as good as the last brand I used but it is ok because of all the plus bits of using v2. The battery charged takes a couple of hours which is great considering my last one took 6 hours min. There is plenty of vapour in these too. My only problem is the delivery of the box took too long they used christmas as there excuse so will have to see how other items are posted out. So word of warning don't run out of carts or liquids as I did. The other e cig I used the co.p any would post out the same day I got them the next day even over christmas. This is the one thing that would make me go back to a company that takes posting more seriously then these do.I have ordered the liquids now as at least I can buy that anywhere if I do run short again. First of all, the batteries are excellent. I've moved from the ego battery to this one and I am really pleased with it. I bought the kit a month ago and had the Congress cartridges which did not give me the same hit as normal 1.8 tobacco flavour. I was a 15-20 a day smoker. I've had to order the normal red v2 cartridges (and moved up to 2.4) and they do not last long at all and have now bought the blanks and using liquid again. I can't find another website where they sell the red v2 ex series cartridges and have been waiting a month and they are still out of stock. Give it a try...(Some of the flavoured liquids make a pleasant occasional change too).